1882 The club was founded in April 1882 and was one of the first tennis clubs in the country. The original site was at the Derby end of the village, near Yates' farm. In the beginning there was no pavilion or dressing rooms. Subscription was 5 shillings (25p) per year. 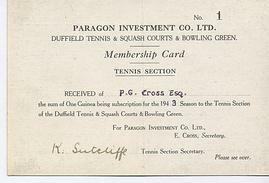 Racquets were provided by the club and cost 28 shillings for 4, an average 7 shillings (35p) per racquet. Only 4 were needed as there was only 1 court. No lady members were allowed on the Committee. A new net cost 15 shillings (75p). 1884 Duffield LTC moved to new ground on Derby side of Ecclesbourne Avenue. Balls were 75p for two dozen & lasted a season. Two new rules: (a) Any member losing a ball was to pay for half its cost, (b)'It is desirable that players should wear tennis shoes'. 1903 The Club became affiliated to the Lawn Tennis Association. Club colours were navy blue & white. 1914 Duffield were involved with the formation of Derby & District Lawn Tennis Association. All future county matches played at Duffield, 'The County Ground'. August 1914, war was declared. On the railway on the first Saturday while members played, long trains laden with heavy guns moved slowly past the courts. 1915 No matches were to be played until Peace was declared. Many Duffield players were in the Armed Forces. In 1916, soldiers from the Duffield Hospital were allowed to play on the courts. 1925 The new pavilion was opened. No shower was built in the ladies' dressing room as this was deemed 'unseemly'. 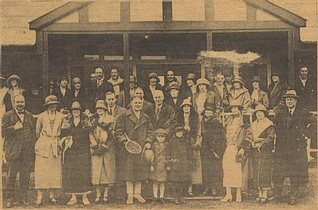 1933 The opening of Derby and County Lawn Tennis Club at Duffield, clubhouse becomes headquarters of Derby LTA. 1937 Squash court was erected. 1943 A group of local business men bought the present site. In 1945, work was completed and the club moved to its new site. 1951 Club member Peter Cross wins RAF Singles Championship. 1957 J. I. Tattersall, Duffield 1st team player, wins both Wimbledon Junior Singles and Mixed Doubles titles. In the Singles final he beats I. Ribero of Brazil 6-2 6-1. In the Mixed Doubles final he partnered Honor Durose, also from Duffield LTC. They beat Ann Haydon and Roger Faulkener, Roger was from Duffield LTC. Therefore in the Junior Mixed Doubles final in 1957, 3 out of the 4 players were from Duffield LTC. 1960 Squash and tennis sections combined to obtain the freehold property. It was purchased from Paragon Ltd. for £3,000 and some members loaned the club £100 in return for free membership until the loans were repaid. 1968 The River Ecclesbourne had regularly flooded the courts leaving thick layers of black sludge which had to be cleared. Derek Povah, Bruce Sephton & others built the present wall on the river bank which involved 3 ft long steel pipes being driven through Stanley blocks, then cemented. Since then (touch wood) there have been no more flooding problems from the river. 1972 New (present) Clubhouse was erected, together with Squash courts. 1979 Duffield share the Men's Division 1 title with Littleover, the last time they will win Div.1 in the 20 century. 1982 Club centenery celebrations saw Duffield players dressed up in attire remeniscent of that worn 100 years previously. The event was shown by the BBC on Midlands Today. 1983 New floodlights switched on with Nick Fullwood, Nick Brown, Jeremy Bates and Steven Shaw playing an exhibition match. Umpire was Ray Bailey. 1985 Regular aeration problems eventually led to three lawn tennis courts being dug up and replaced by carpet. This followed a working party visiting other clubs with different surfaces including one club which had recently laid artificial grass courts in North London, and the working party played on them. This experience, together with Wimbledon's recommendation, led to the present courts being laid. 1988 Top 2 courts re-surfaced and new floodlights installed on courts 1, 2 & 7. 2004 Duffield win Lawson-Wood Cup. The team of Mark Elks & Caroline Wood, Shona & Mark McAnulty, James Russell & Carol Winfield beat Ockbrook in the final. 2006 Men's 1st team wins Div. 1 title for the first time since 1979. Men's 2nd team wins Div. 2 and Men's 3rd team win Div. 3. 2007 Bottom 3 courts (3, 4 & 5) have floodlights installed, the club now has 6 floodlit courts. Clubhouse lounge is refurbished. Men's 1st team come 2nd in Div. 1. Men's 1st Team win Div 1 title again. 2009 Men's 1st team win Div. 1 title for second consecutive year. 2010 Men's 1st team win Div. 1 title for third consecutive year. 2016 Courts 1 and 2 resurfaced, with courts 3,4 and 5 following in 2017. A bonanza year for the ladies’ summer league teams, with the 1st team winning Division 1 for the first time in 18 years.The Ladies’ 3rd team won Div. 2 and the 4th team won Div. 3, with the second team maintaining their place in the 1st Division and the fifth team coming a close second in Div. 4. The Mixed team also had a good season, crowned by winning the Lawson Wood Cup. The Club received the Club of the Year accolade at the Derbyshire Tennis Awards for the third time in four years.